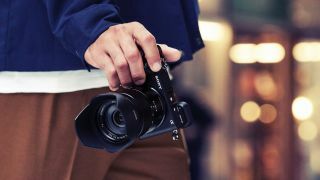 Sony not only makes most of the imaging sensors found in fellow manufacturer’s digital cameras, its innovation in the recent past has extended to it being the first to market with full-frame mirrorless cameras: witness its ever-popular and ever evolving A7 series. In the wake of the range’s success, its rivals have gradually yet increasingly attempted to follow suit, with Canon and Nikon respectively just recently introducing their own EOS R and Z families of full-frame mirrorless products. Yet Sony’s A7 series offerings, now several generations down the line since the original A7 of 2013, continue to win acclaim among enthusiasts and professional photographers. They’re not only the best Sony cameras you can buy right now, but, arguably, among the best digital cameras you can buy right now full stop. More enticing still, the fact that this mirrorless range has been around a lot longer than many of its competitors means that there are a greater number of directly compatible lenses and accessories currently available. That’s another sensible reason to specifically buy into the Sony brand. Success has also come via the manufacturer’s methodology of including physically larger sensors in conveniently portable designs, thereby delivering both quality imagery and convenience in spades; something that can also be witnessed through the development of its premium RX family of compacts. These cameras twin big-for-their-class one-inch sensors with Zeiss optics – something that has also extended to Sony’s matchbox-like RX0 model. Now also in its second generation, this camera features a one-inch chip, enabling its manufacturer to claim it the world’s smallest and lightest premium compact camera, currently. This reasonably priced pocket rocket of a compact marries a useful 18.2 megapixel resolution from a back illuminated 1.2/3-inch sensor to an equally capable and useful 10x optical zoom, starting out at a wide angle 25mm. Images are composed via a 2.7-inch LCD, which, unsurprisingly for a budget model, isn’t touch sensitive. AF responses are satisfactory under normal lighting conditions, however, though the camera does hunt around a little bit in the dim. Likewise, video resolution is Full HD rather than 4K, but we do get built-in Wi-Fi and NFC connectivity as compensation. In short, the undemanding WX220 will tick a lot of boxes for photographers wanting something easy to use, portable, inexpensive, yet a digital camera that is still capable of taking some decent pictures and videos with it. This is a veritable powerhouse of a premium compact camera, swelling Sony’s long running RX100 range of such with, this time, sizeable updates, including a broader zoom range than its predecessors at 24-200mm equivalent with an f/2.8-4.5 aperture range. Also a first for this line up is touch screen control, courtesy of the 3-inch tilting LCD at the back, even if said screen’s resolution has oddly dropped slightly, while the camera further squeezes in an eye-level viewfinder of 2.36 million dots to help its enthusiast credentials. A possible issue with a zoom lens on a compact camera is the visible effects of camera shake when shooting handheld; fortunately the mark VI combats this with optical image stabilisation promising a four-stop advantage. We also get a staggeringly impressive 24fps burst shooting speed for up to 233 JPEGs. While accessing some features can be fiddly, there is a wealth of photographic opportunity offered here. Want a whopping 50x optical zoom reach, without breaking the bank? That’s what this dirt-cheap Sony bridge camera with built-in optical image stabilisation offers. OK, so the sensor on offer here is of bog standard 1/2.3-inch size, even if it is back-lit, and boasts a respectable 20.4 megapixels, but image noise is thankfully kept to a minimum at higher ISOs. As well as a 3-inch rear plate LCD that usefully tilts for composing and reviewing stills and videos, we also get a 0.2-inch eye level viewfinder, which is impressive at this price point. Battery life is so-so at 300 shots per charge, but add in built-in GPS, Wi-Fi and NFC connectivity and it appears as if we are getting plenty of bang for our buck with the Sony HX400V. Looking for a bridge camera or super zoom in Sony’s range? Then, if your budget can stretch, the RX10 IV is a winner, coupling a 24-600mm equivalent zoom with a large one–inch sensor. This sort of spec means the camera is relatively bulky, as well as pricey, even if, as a ‘one size fits all’ solution, it does deliver class leading stills and video. Coupled to this, the operational back of the camera – namely the EVF and tilting LCD screen – delivers high quality, with the latter now implementing a touchscreen. As you’d expect, the camera feels robust in the palm and the grip is generous enough to be able to secure a firm hold, backed up by 5-axis image stabilisation. At most focal lengths the camera delivers crisp imagery, though there’s the slightest hint of vignetting at the far edges of the frame. Though most users may shoot Raw files, details from JPEGs straight out of the camera are nevertheless punchy and pleasing. A competent all-in-one, if you don’t mind the price and (relative) bulk. Arriving with the claim of being the world’s smallest and lightest premium camera, this tiny second-generation 1-inch sensor based model can now shoot 4K video. Furthermore, it’s not only ultra compact, but crushproof and waterproof with it. Along with a neat 1-inch sized 15.3 megapixel Exmor RS CMOS sensor at its core, the RX0 II also sports a top class Zeiss Tessar T* 24mm f/4 fixed wide-angle lens, while we also get 1/32000 sec shutter speed and 16fps continuous shooting. This second-generation model comes with a Soft Skin Effect mode and advanced Eye AF, but equally usefully, like most compacts these days, is that the RX0 II manages to squeeze in a tilt-able LCD screen (capable of tilting up to 180° and down by 90°). Finally, we like the fact that the kit version includes a nifty VCT-SGR1 Shooting Grip for added stabilisation when shooting stills or video hand held. This mid range, magnesium alloy bodied mirrorless camera features an APS-C sized sensor rather than the full-frame chips sported higher up the range, yet sees a 1.8x faster processing speed than its A6300 predecessor. This is, in part, thanks to a Bionz X processor which has also afforded an ISO range extension to ISO102,400. But the A6400 really struts its stuff when it comes to Auto focus performance, in delivering a blisteringly fast 0.02 second AF. While that’s great, this model doesn’t offer in-body anti shake, unfortunately – look to the higher spec A6500 for that. We do get a usefully tilting touch-sensitive display on the rear however, even if it does stick to a 16:9 aspect ratio, which, while suitable for 4K video, means the display ‘shrinks’ for stills. Unlike semi pro models there’s just one SD card slot here, but we do get the expected Wi-Fi, Bluetooth and NFC connectivity. In short this is a very sophisticated APS-C sensor mirrorless option you’re buying from Sony. AF systems are a key focus for manufacturers at present, and on the A6500, its range-topping APS-C sensor compact at the time of writing, Sony has pulled a fast one – a lightning swift one, in fact. Impressively responsive auto focus is backed up by the first inclusion of a 5-axis image stabilisation system on a Sony APS-C model, and a tweak to the camera’s buffer that sees it able to deliver a sequence of 307 full size JPEGs or 107 Raw files, at a respectable 11fps burst rate. Also new here is touch screen operation, while, in offering 4K video capture, the A6500 boasts just about everything videographers could want, save for lacking a headphone port perhaps. With JPEGS straight out of the camera looking very good indeed, this is a fully featured mirrorless compact that, if full frame capture isn’t a required option, could be well all the Sony camera you’d ever want. The Sony Alpha A7 III may stand on the starting line of Sony’s full-frame mirrorless range, but it still holds massive appeal for enthusiasts and pros who may otherwise be eyeing something higher up, thanks to features borrowed from the A9 and A7R III. These include that larger back illuminated sensor not over-burdened by a respectable 24.2MP resolution, plus built-in 5-axis image stabilisation and 4K video capture that utilises the sensor’s full width. Usefully, the tilting back plate LCD is touch sensitive to provide a best of both world’s approach to handling the camera, although it doesn’t allow for quick navigation of the menu. We do get a high resolution, life-like eye level viewfinder though, while the camera shows its semi-pro mettle by offering two SD card slots, one of them supporting fast UHS-II cards. What we were most stunned by though is its 693-point AF system. Put simply, this one ticks a helluva lot of boxes for anyone getting into full frame photography. At the heart of this full-frame mirrorless option is a whopping 42.2 megapixel resolution sensor. Like Sony’s own A9, this is married to its maker’s FE full-frame lens mount, while also impressing us is a very life-like, high resolution 3,686,000 electronic viewfinder. The alternative for composing and reviewing stills and 4K-video is a tilting 1.44 million-dot resolution LCD on the rear plate, which once again has the bonus of touch sensitivity. Showing its high-end mettle, the camera features a magnesium alloy construction that is dust and moisture sealed. It’s portable too, at a manageable body only weight of 657g, while the AF performance – in being both swift and accurate – is once again the jewel in this camera’s crown. To sum up, this third generation of Sony’s high resolution offering is both an all rounder and a seriously capable one. You’ll have a lot of expectations coming to the range topping Alpha A9; fortunately it doesn’t disappoint. Once again the AF system on this full frame sensor-incorporating camera is incredibly quick and responsive; we get a built-in 5-axis anti shake system; plus 20fps burst shooting for 362 JPEGs or 241 raw files is not to be sniffed if you’re a sports or action snapper. While a ‘modest’ 480 shot battery life can’t match that of pro DSLRs, this Sony is a serious rival in most other respects, including an ISO range expandable to ISO50-204,800, while offering 4K video too. We also like the big and bright electronic viewfinder on this camera – which incidentally at 3,686,000 is the highest resolution EVF its manufacturer has ever utilised for this series. In short, this is a phenomenal option for buying into Sony’s pro-grade full frame mirrorless.